Municipal leaders struggle with the competing budget demands. Some of the current trends in EMS industry present opportunities for local leaders to extend their budgets further. Shifting community needs may be an opportunity for local government leaders to examine how public safety personnel and resources can be reassigned, retrained or reconfigured to better meet community needs without significant, new investments. By tailoring use of public safety resources per response type as opposed to funding readiness at all times, it may be possible to better address public safety needs within budgets. In addition, new programs and payment models may present ways to offer better quality care while consolidation in EMS could affect how community leaders negotiate contracts. And, how leaders respond to the disturbing rise in suicide among EMS and other public safety professionals may require policy changes and resources. By asking the right questions, local government leaders can steer their communities toward better outcomes for citizens and first responders. One of the biggest shifts happening in EMS service is a move away from response times as a one-size-fits-all measure of success. Historically, the measure of how long it takes an EMS team to respond to a call has been considered a critical measure of success. Today, it is estimated that high-acuity calls make up only about 30 percent of EMS calls1, according to researcher Christopher H O Olola, PhD, director of Biomedical Informatics and Research at the International Academies of Emergency Dispatch. There is a rapidly growing volume of non-emergency calls, which require only a basic life support response. Patient outcomes are not affected by whether it took EMS providers four or six or 10 minutes to arrive on the scene. The costs of maintaining an EMS service are based on a need to maintain a readiness to respond, which is expensive. In comparison, actual EMS responses are relatively cheap, particularly when a service can collect against the work it is doing. Changes in response time measurements can affect local budgets. Specifically, greater flexibility around response goals may offer leeway in the cost of readiness and staffing. 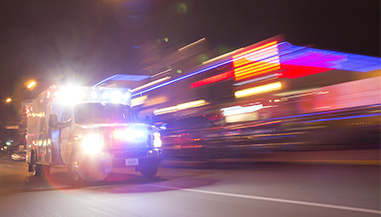 For municipal leaders, it is important to consider the fact that the EMS industry is now recognizing that response time is not necessarily a good predictor of patient outcomes. In lieu of a focus on response times, the EMS industry is shifting to developing systems and measurements to right-size EMS response. What is the right goal for response time? Should the response time goal be different based on the type of call? What is the right number of responders to assign to a call and to a service? Who are the right people to make up an EMS team? At the national level, there is push for new performance measures for EMS. This is a dialogue local leaders can engage in with their EMS leaders and fire chiefs. Municipal leaders can better understand their local EMS response by inquiring for information beyond response time measures. How many people in the community are being resuscitated every month? Do citizens who are treated or transported by EMS receive patient surveys? On average, how often do citizens call 911? How many ‘frequent fliers’ or high volume users does the EMS service have? Does the use of the EMS system suggest other unmet needs in the community? Although municipalities continue to need some form of a fire service, many communities are starting to critically analyze how fire protection teams and resources might be applied to growing population health needs. According to the latest report of the National Fire Protection Association between 1977 and 2014, the number of structural fires, including in residential and commercial buildings, has dropped more than 50 percent and fire fatalities are down 70 percent2. The fire service has achieved these dramatic results through community education and by lobbying for legislation that mandated changes in building code, including more widespread use of sprinklers and new construction requirements. The effectiveness of the fire service in implementing fire prevention measures to make fires less likely and less fatal offers an important model for consideration by the EMS and healthcare industries, as well as local leaders. Already, most fire services have made dramatic shifts in how they spend most of their time. Today, an estimated 70 percent or more of calls to a fire service are EMS-related calls3. Yet, training and staffing may not yet reflect the fact that a majority of the calls firefighters respond to are medical calls. What can be learned and applied from the fire service’s success in preventing fires? How can the fire service be tapped to provide new resources for meeting the community’s population health needs? Mobile integrated healthcare (MIH) programs, also known as community paramedicine, deploy EMS providers to offer disease management support and primary care in the community. These programs remain a hot topic of discussion in EMS and offer the promise of extending care into the patient’s home. However, most municipalities have yet to figure out how to make these programs financially sustainable. In many ways MIH programs offer the promise of doing for healthcare what fire prevention measures did for firefighting, i.e., dramatically decrease community demand for these services through prevention. Although there are no healthcare policy mandates that require a person who recently had a high-risk surgery to be visited at home by paramedics, many EMS and healthcare professionals recognize that these programs can extend the continuum of care into the home and drive better patient care and better outcomes. While payment models to support these programs are still being sorted out, city and county leaders can expect to see more attempts at public-private partnerships between public safety services and healthcare organizations to implement these programs. For example, the city of Dallas sought support from the three largest medical centers in town to run a community paramedicine program through its publicly-funded fire department. The EMS industry is also bracing for changes in the payment structure, namely a shift towards capitated payments. Capitated payments are one of the models put forth under the Affordable Care Act. The payment structure simply refers to lump sum payments per patient to the healthcare organizations involved for all healthcare services rendered. These services would include pre-hospital care and transport as well as any care given in the hospital. Capitated payment models will necessitate that the various providers in the healthcare industry separately negotiate their reimbursement percentages among themselves. Proponents of this payment model also suggest that it can help healthcare providers move towards a focus on the population health and devise the most efficient way to care for groups of people. Many healthcare professionals suggest this model encourages providers to offer more patient-centered, higher-quality care because they are financially incentivized to meet the patient’s needs with as few services or visits as possible. In this way, capitated payments are more in line with the Institute for Healthcare Improvement’s Triple Aim, which focuses on developing healthcare systems that offer better patient experience and better population health at lower cost per capita. For municipal leaders, the important thing to understand about capitated payments is that EMS providers would be paid a lump sum to care for a community, regardless of how many times the community calls or engages EMS in a given year. The on-going consolidation of companies in the EMS industry is expected to continue. In some areas of the country, there may be a few EMS companies, but in many areas of the country, there is only one provider because larger providers have bought out the smaller, previously existing companies. For municipal leaders, the industry consolidation trend may force them to consider the advantages and disadvantages of a competitive bidding process for EMS service contracts. Some local leaders may decide it is more advantageous to sole source negotiate since there may not be more than one EMS service available to submit a competitive bid. Many municipal leaders are taking heed of the disturbing number of suicides among first responders and seeking ways to better support and care for their city’s public safety professionals. With striking examples like eight suicides among Canadian first responders in the first five weeks of 2016, many cities are beginning to recognize the mental health crisis among EMS professionals, police and firefighters. One recent survey of 4,000 first responders found that they were 13 times more likely to have attempted suicide when compared to the average American adult4. Some municipalities are now passing policies and legislation to protect first responders. For example, three Canadian provinces—Alberta, Manitoba and Ontario—have introduced legislation that would allow first responders to claim workers’ compensation for post-traumatic stress disorders. Other municipalities are pursing stress management trainings, employee assistance programs and peer-support programs. Although many cities are struggling with budget constraints, caring for a community’s first responders is a moral obligation and a smart investment, which can prevent turnover, high sick leave utilization and ultimately, save lives. 1 Unpublished data, communicated April 4, 2016 by Christopher H O Olola, PhD, Director of Biomedical Informatics and Research at the International Academies of Emergency Dispatch. Percentage based on six US-based ambulance agencies, handling approximately 3.2 million medical calls April 2004 – Jan 2015. 2 Marty Ahren. Trends and Patterns of U.S. Fire Loss. National Fire Protection Association, Quincy, MA: February 2016. 3 Phil Keisling. Why We Need to Take the ‘Fire’ Out of ‘Fire Department.’ Governing. July 1, 2015.